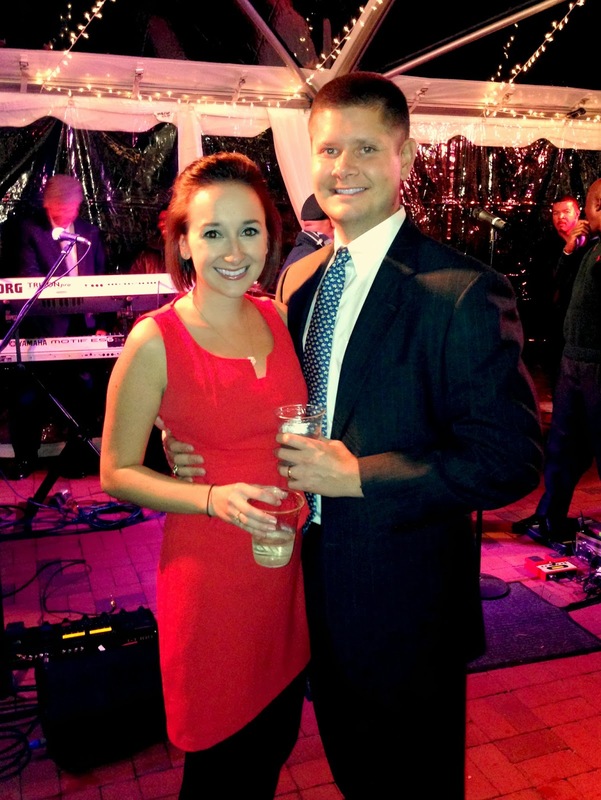 This weekend we went to a wedding in Columbia. This wedding ended our marathon of weddings for the last two years. We don't have another until November of 2014, and we sure did end it with a good one! The bride, Meg, and I have been friends since high school. We also went to college together, and were in the same sorority. Meg married William, her sweet long-time boyfriend who is a Citadel grad. The wedding and reception were absolutely beautiful. 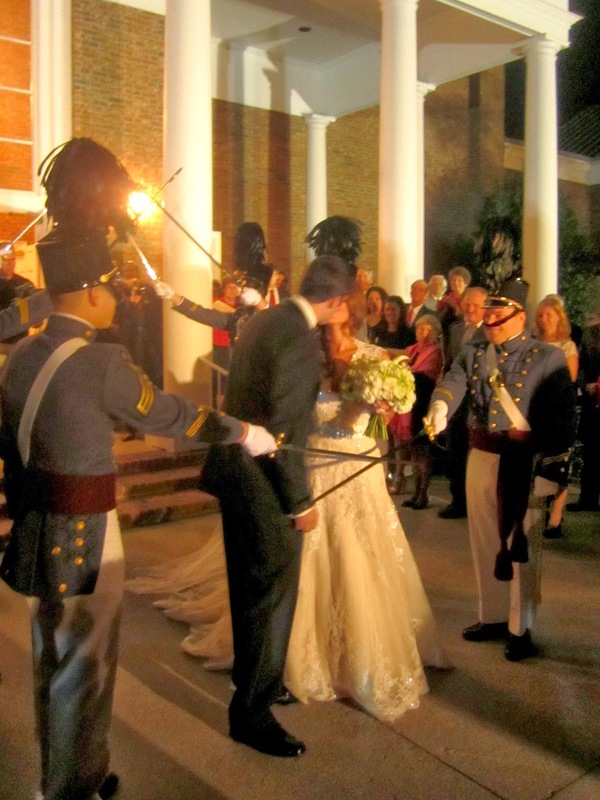 Southern and romantic with a lot of great Citadel tradition. I love the Sword Ceremony at a military wedding. This is where they stop the bride and groom from exiting the church until they provide the password, which happens to be a kiss. One of my favorite parts about a wedding reception is seeing the personal touches that the couple adds to the event. I love seeing how a bride and groom's reception reflects who they are. Meg and William are both big hunters. Don't be fooled by Meg's small figure and beauty. The girl can out hunt and fish you any day. So, in addition to the traditional wedding food (which was awesome) they also served venison. I must admit, that's the first time I've ever seen that offered at a reception, and I loved it! 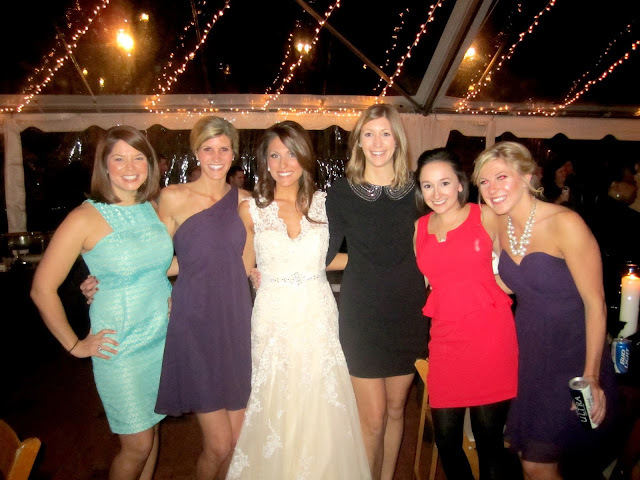 Here I am with the bride and all of my best friends from high school. The band was soooo good. Something about them just made me want to dance all night, and their music even managed to get T out on the dance floor. It was so much fun dancing the night away surrounded by some of my best high school and college friends. What a fun night we had, and congratulations to Meg and William! Fun wedding! I've never had venison before but love that they added that as their personal touch! Her dress is stunning. What a great wedding!